Parliament is a fascinating edifice. When we lived in Wellington, we would sometimes listen to parliament on the radio, and in the 1980s, when Muldoon governed and David Lange opposed, we would rush to the public gallery and observe the theatre. Now with MMP, parliament is a little different, but every afternoon you can watch Question Time on television, which is often still very theatrical. At the beginning, amidst much pomp and ceremony based on the Westminster model from which our parliament derives, the Speaker is summoned, and the occasion begins. Until she retired last month, Te Horo’s Mary Harris played a leading part in these ceremonies as Clerk of the House of Representatives. The Clerk sits at the Table in front of the Speaker when the House is sitting and wears a barrister’s gown and bands. On ceremonial occasions, such as the opening of Parliament, the Clerk also wears a short horsehair wig. It’s all terribly formal, and some might say anachronistic. On sitting days in Parliament, following the prayer, the Speaker informs the House as to whether petitions, papers and select committee reports have been introduced and the Clerk announces them to the House. The Clerk is the chief executive of the Office of the Clerk of the House of Representatives and is responsible for the management of the Office. The Office has a staff of about 100, and provides secretariat support to the House of Representatives. On her last day in parliament, the Clerk was obliged to sit impassively while speakers from each party did their best to embarrass her as they paid homage. Rt Hon JOHN KEY (Prime Minister): I seek leave to move a motion without notice recognising the retirement of Mary Harris, the Clerk of the House. Mr SPEAKER: Is there any objection to that course of action being followed? There is none. Rt Hon JOHN KEY: I move That this House recognise the retirement of the Clerk of the House, Mary Harris, and put on record our appreciation and thanks for her years of service to Parliament. Mary was appointed Clerk in December 2007. She began her career in Parliament in 1987. Before coming to Parliament, she worked for the Department of Statistics, producing the labour force statistics in the household labour force survey – team. She was a professional violinist, captained the Wellington women’s cricket team from 1982 to 1986, and was vice-captain of the international 11 in the 1982 Cricket World Cup in Christchurch. Since Mary became Clerk in 2007 she has served three Speakers—Margaret Wilson, Lockwood Smith, and yourself, sir—all of whom speak very highly of her work and the leadership she has shown, in particular her focus on working with the Parliamentary Service to achieve common goals in the service of Parliament and parliamentarians. Mary’s last day is on Thursday, and I understand that she will be spending some time after that cycling around Italy before returning to build a new home in Ōtaki and to focus on honing her goal of becoming an expert fisher. I know that we all wish her well for retirement, and that we look forward to a booty of great smoked fish being delivered to Parliament and tabled when we can at the next opportunity. Hon ANNETTE KING (Deputy Leader —Labour): Mary is our first woman Clerk and our first non-lawyer as a Clerk, and she has led the House through a great period of change, particularly technological change, with the e-committees. Some of us are still getting to grips with those changes, Mary. She embraced change, but not at the expense of Parliament’s enduring values. She has shown a strong commitment to finding new ways for Parliament to be open and accessible to the people who elect it, and we are the better for it. With Mary’s guidance there have been some important changes in the procedures for the smooth running of the House, such as extended sittings. Under her leadership, the Office of the Clerk has been described as a “little gem”— I think that is probably a pretty good description of Mary herself, actually. MPs have come to regard her as an impeccable and impartial source of advice, and, like her predecessor, she too is now widely respected in Parliaments around the world. For example, Westminster, the home of our type of parliament, sought her opinion on their governance arrangements earlier this year. Mary Harris was born in New Plymouth, where her father was a teacher. The family moved to Wellington when she was 4, and dad joined the Correspondence School. Mary attended Karori School, then Wellington Girls, before completing a double major at Victoria University in Music and Geography. On graduating, she joined the Wellington Regional Orchestra as violinist, while working part-time for Prudential Assurance. After two years she was promoted to Manager of Superannuation and later joined the Department of Statistics, where her insurance training saw her involved in a review of finance statistics, then the development of the Household Labour Force Survey. Inside two years she became an executive assistant to the Government Statistician. While developing her career, Mary found time to play cricket and to continue playing the violin. She captained Wellington, and managed to score a few centuries, and played in the 1982 World Cup where she was co-opted into an International X1. She gave up cricket at age 33 but continued playing the violin until the mid 1990s. In 1987 Mary moved to Parliament, when advisory staff were being recruited to enhance the support for select committee scrutiny. In years gone by, Parliament was ruled by Prime Ministers. Massey and Seddon held sway over obedient party members, and dictated how the place was run. Muldoon ruled likewise, but by 1984 he came under challenge from his own back bench and lost the ensuing snap election. By the time Speaker Margaret Wilson appointed Mary as Clerk of the House in 2007, MMP had replaced first past the post system some thirteen years previously. 2007 and 2008 were very challenging times for the speaker as the Labour Government’s fortunes waned and the National Party took the ascendancy in the House. Members used question time, always the noisiest part of Parliament, to make political speeches, as thinly-veiled questions. This posed a challenge for Mary in reconsidering the Standing Orders to find a way to ensure questions and answers were just that: questions to Ministers and answers from Ministers, and in so doing assist the Speaker to maintain order during question time. MMP was a significant change in our governance, and required Mary and her team to think about how best to serve Parliament. Previously, parties had not been recognised in Standing Orders and it took quite some time for the culture of parliament to embrace MMP. Eventually Select Committees scrutiny was enhanced and more committee inquiries undertaken. Select Committees, in Mary’s opinion are critical to proper parliamentary scrutiny, because it is there that detailed work can be undertaken and the public’s voice heard. In her time, Mary Harris served under eight Speakers. Interestingly, few of them sought the position. I inquired who was the best, not really expecting anything but a ‘Yes Minister’ response. Mary’s discretion, honed over 29 years did not let her down. She did allow that Lockwood Smith, thanks to a background as television quizmaster was a great questioner, an excellent performer at question time. A poacher turned gamekeeper, he became a good Speaker and is now doing well as our High Commissioner in London. One of the roles of the Clerk is to accompany Speakers attending international parliamentary conferences and undertaking parliamentary diplomacy. ‘Speakers can open doors where junior diplomats cannot’. In this context Mary travelled to Kenya, Botswana, Namibia, India and Trinidad, as well as the more usual Australia, Canada and United Kingdom. In addition, she enjoyed advisory work with our near Pacific neighbours. In her opinion, our Parliament is well-regarded world-wide, but sadly not so much at home. The media’s portrayal of members focused on the politics and personality rather than the policy substance of what Parliament is doing, along with members’ own behaviour at question time contributes to this dim view. In England Mary visited the House of Lords, which she saw as a ‘house of wise heads that knows its place as an elected body’. I asked whether she thought NZ would benefit from an Upper House, and received a polite history lesson, not realising that we had an Upper House until it was abolished in 1950. She doesn’t see a need for it now, but recognises that there are governance issues to be confronted in the future; how regional government, particularly with the increasing size of Auckland, and central government are held to account and the role of iwi in post-Treaty settlement era, and the place of the Treaty itself are issues that might benefit from a specialist house. Mary’s stewardship saw considerable change in the way Parliament is communicated, in particular the adaption to digital technology and the growing use of social media. Mary has strongly promoted communicating what Parliament is doing, so that the public can and will participate. Social media has given members a very effective and immediate communication tool, whether it be Twitter, Facebook or blogging. We discussed how the youth were now embracing parliament via social media. Voter stats show a downturn in voter turnout amongst the youth. If you don’t vote in your first two elections, you probably won’t ever vote again. Mary is keen on outreach programmes in schools, to ensure better engagement by youth with their MPs. Greatest achievements? It’s hard to get a modest person to answer objectively, but on reflection Mary allowed that the evolution of Standing Orders to balance the Government’s desire to progress parliamentary independence, through the introduction and passing of the Parliamentary Privilege Act along with advocacy for the proper determination of the services Parliament requires to be effective. From the accolades bestowed on Mary Harris, I think she has succeeded. And what now? Mary’s off for three weeks cycling in Italy; from Verona to Como, then to Turin and the Po valley. From a tough Kiwi winter to the delights of summer in a foreign country, pedalling no more than 70km a day and immersing herself in history. 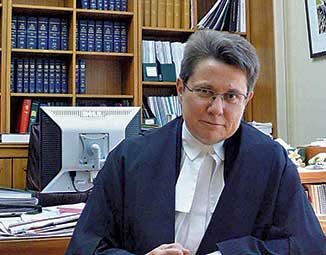 Back home, she has one more task to perform for parliament: carrying on the good work of past Clerk, David McGee, producing the 4th edition of Parliamentary Practice in New Zealand. Then she’s going to build a new house up on the Plateau. Who said retirement is boring?